In the center of the window, there is a pane that displays the results of your search. Right-click a found file to perform various operations with it (copy or cut the file, view its properties). Press Enter or double-click a file to open it. On the Replace tab, you can check and uncheck the small boxes to select the occurrences that you want to replace. If you want to select only a few occurrences, press Clear All button first, then click the boxes near the occurrences that you want to replace. To check and uncheck boxes from keyboard, press Space button. You can also press Insert button to check a box and move to next box (similar to selecting files in Norton Commander). Use Ctrl+C to copy the file names and the occurrences to clipboard. If you do not want to copy the text after and before the matches, press Ctrl+Shift+C. The lower pane on the Search tab is called “context viewer”. It shows you the lines of the file where the text was found. You can list the file with arrow keys, Page Down, Page Up, Ctrl+Home, and Ctrl+End keys. Syntax highlight is implemented for HTML, CSS, JS, and PHP files in this version. More programming languages will be added later. If the file is larger than 1 MB, it's not highlighted. The status bar displays the number of files and matches found. Also shown are the total numbers of files searched and skipped. This information is often useful for troubleshooting. For example, if the number of files searched is zero, the folder you selected may be empty, or the file mask you entered may be too restrictive. The skipped files are binary files that have the extensions listed in the Options dialog. The right part of the status bar shows the name of the selected file and its encoding. Sometimes there are a lot of matches in one file, and its name is scrolled out of the screen. 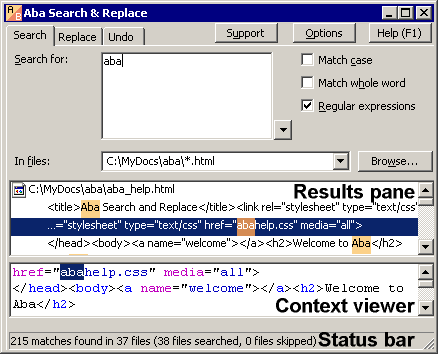 In this case, you can look for the file name in status b	ar. The encoding information is also useful for troubleshooting.